Your voice is the connecting force between your inner and outer world. Your voice takes your inner life and makes it manifest: gives it shape and substance and meaning for others. Online, your voice is who you are. Readers take that voice and construct their sense of your identity around it. If you show your inner life and it connects with their inner lives, it creates emotional resonance (what we’re all hungry for), and they will follow you wherever you lead them. On some level you have to feel entitled to speak: to stake your claim and take up space in the world with your opinions, the contents of your psyche. This is why voice can be a sign of privilege. Often it’s the person in the group with the most status and power who talks the most. When I was much younger, I was involved with some people who had a man at the head of their clan whom I shall call M. M was from a different generation, a different culture. This is maybe why the others didn’t call him on his (blatant) misogyny, but treated it more like an irritating quirk, like someone who stands too close to you at a party. “Women are like dogs and children,” he was reported to have said, “they should be seen and not heard.” This meant that at certain dinners, he and two other men would monopolize the conversation and treat us women and children as if we didn’t exist. I would sit for well over an hour, maybe two, bored out of my skull. “No,” I snapped, and he looked at me in surprise. Looked at me for what was possibly the first time that night. “You have no idea what I was going to say and absolutely no right to speak for me.” I said a few more things, the gist of which was that he had no respect for women and I was tired of it. I learned something valuable that night, something I knew intellectually and had even discussed in post-colonial literature classes in college, but didn’t hit me on a visceral level, didn’t become the kind of knowledge I felt in my body, until that encounter with M.
It was simply this: silence is not a neutral position, whatever your intentions. Silence automatically supports the status quo. When you are a presence that lacks a voice, you create an empty space that another voice – a dominating voice that knows no boundaries – is only too happy to fill. If you don’t tell your story, someone else will tell it for you. A voice is a story. A story is a powerful thing. You only have to look at politics. The war between the Republicans and the Democrats is a war between two conflicting stories of America. Stories don’t just explain who we are and where we’ve been, they set the course for our future. If our story denies climate crisis, then we’re not going to take action against it. If our story characterizes women as little more than overgrown children, as it used to, then their demand for the vote would seem shocking and laughable. Change the story, and you change the culture. This is true on a personal level as well. The past is the past, and it’s true that you can’t change it. But you can change the way you interpret it. You can view it through the lens of a different perspective and see things you overlooked before. You can make yourself out to be the victim of circumstance (and thus powerless to change anything). You can make yourself out as the star of your own hero or heroine’s journey, in which case everything that happens to you has a deeper purpose: to force you to change and grow, to become the person you need to be in order to meet your true destiny. ‘Finding your voice’ becomes a kind of code for finding yourself. Voice is what you say and how you say it; the two seamlessly weave together, the dancer and the dance. Which means it’s not just something you find, but develop and practice. You find it through paying attention to what attracts you, to what you’re drawn to: the ideas, people, subject matter, and also the medium. Maybe your true voice isn’t a spoken one; maybe its purest form comes through visual art, or sports or dance, or writing, or invention, or math, or multimedia, or music, or fashion. Discovering your medium can be a revelation. It makes possible a conversation that you didn’t even know you could have. Which is why it’s so important not to quit searching until you find it. You develop your voice through practice, and also through mastering your tools. When you can use those tools in a way that others can’t, you have a decided advantage. You can also move more deeply into yourself and the world, manifesting your inner life with greater depth and nuance. Magic happens when you learn a technique so well that it becomes a part of you. You become more of what you are. You push past the boundaries, stop mimicking others and start truly creating yourself: your signature style, your voice. When you get really good, you can draw other people into your story and make them a part of it. This is known as creating a movement. This is why, I think, there are so many people who feel pent-up, restless and yearning inside; they want to create but have the mistaken notion that they are “not creative”. Nobody wants to feel trapped and silent. We all have the innate human drive to express ourselves, to speak, to make meaning from the stuff of our lives. The ultimate creative act is to invent (and reinvent) yourself. Somewhere out there is your audience. They are waiting for you, and always have been. That is the nice thing about raising our voices on a blog. No one is there to muffle or interrupt it. When I was 18 I used to rock climb with no rope, once up a 100′ cliff. Later I walked in the Brazilian rain forest, gang infested, searching for escape routes which I would have to use 5 or 6 times. I only recently used these experiences as my voice. Our voice is always there. We just have to find it, and then be brave enough to use it. It took me a long time to find that bravery. Not sure why. What’s criticism compared to a cliff, or getting raped or killed by gang bangers? Our deeds feed our voice. would anyone be reading this if it wasn’t for justine’s former relationship with elon? @Gordon That definitely puts it in perspective. Reminds me of the David Bowie quote (I think he was quoting Brian Eno): “Art is the only kind of plane crash that you can walk away from.” Or something to that effect. On the other hand, MRI studies show that the brain registers criticism, social slights and drops in status in the same section that registers physical blows. So there’s a reason you need a tough skin — or better yet, to separate your ego from your work. Such an important note… That silence isn’t neutral. We have to also speak for those who haven’t yet found their voice and show them the importance of using it. This reminds me of a trick I’ve started using. Too often, I let myself get carried away on a tide of negative emotion. I start to worry and fret over the future. In order to give myself some piece of mind, I created an exercise where I write the end of my story. I give myself my own happy ending. It’s kind of silly, a bit reminiscent of that whole “manifesting” thing, but writing about all the good things that will happen, especially writing how they will happen, makes me feel more secure about my future. “The ultimate creative act is to invent (and reinvent) yourself.” So very true, so very challenging and yet probably the most rewarding activity anyone can do for themselves. @justine musk That Bowie quote makes me think of what an actor (in my first short – filmed last week!) said about acting and writing. “Writers make their mistakes in private, actors make theirs in public” As a writer, I can walk away, think about the best comeback line, and then put it down. And if it fails, no problem, I can fix it and fix it until I get it right. Great post. It is so empowering to find your voice. We all have been guilty of just staying silent and it is a depressing place. We all need to be ourselves…fully. @William That’s a great trick. I’m going to try that. 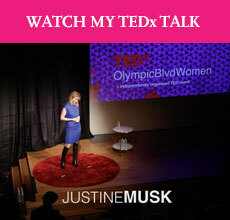 Thank you for owning your thoughts Justine – so inspiring for all ages, and not just for women. You may have started this site after Elon to find yourself, but it has turned into a lighthouse for other “searchers”. Only if critics could also voice who they are, they would be half as courageous and transparent. Finding your voice is the most liberating thing. You’ve articulated some great reasons why Justine. You hit home with this comment. I am writing a novella rooted in life experience. It includes a love of your life relationship with a man who proved to be troubled. Some things can hurt you until your soul is crying. It’s in meeting that fear, and coming to posts like this, that the courage is found to continue, and thrive. Who on earth is Elon? I especially love the part where you denied Mr M the right to speak for you when he had no idea what you were going to say anyway! I came across this page as I am researching for my documentary which is about my story, an artist from a Southern African country (a former British colony) who now tours the world and still finds himself having to explain why he speaks English so well when it is in fact his first language! They find it hard to believe I spoke this well or had such a clean accent before I ever left my country, never mind the fact that I studied Latin/French/Cambridge subjects at high school! I have come to realise that it is paramount to tell my ‘African’ story of diversity, creativity, resourcefulness, ingenuity and optimism since the World’s image of the great continent is so outdated and still obscured by an oppressive history, even in 2017. Warmest regards and thanks again for a great read.